Get your ads to market faster with one place to send your entire campaign — in perfect quality — to TV, digital, print, out of home and radio destinations around the world. Adstream Asset Delivery spans every continent, connecting over 79,000 cross-media destinations across 141 countries, powered by teams speaking 45 languages. Send TVCs, videos, social media content, movie trailers, music promos and cinema ads to broadcast, digital and out of home destinations. Get perfect-quality print and image ads to magazines, newspapers and out of home destinations in a single click. Reach radio stations across the globe. Just upload an audio track, script and media instructions. Quickly move from production to playout by syncing finished content from Digital Asset Management to Asset Delivery. It's one intuitive process for your team, and the industry's fastest global distribution workflow. Send with complete confidence. Asset Delivery keeps your content looking and sounding perfect wherever it goes by rigorously checking and optimising each file to the destinations' specs before sending. 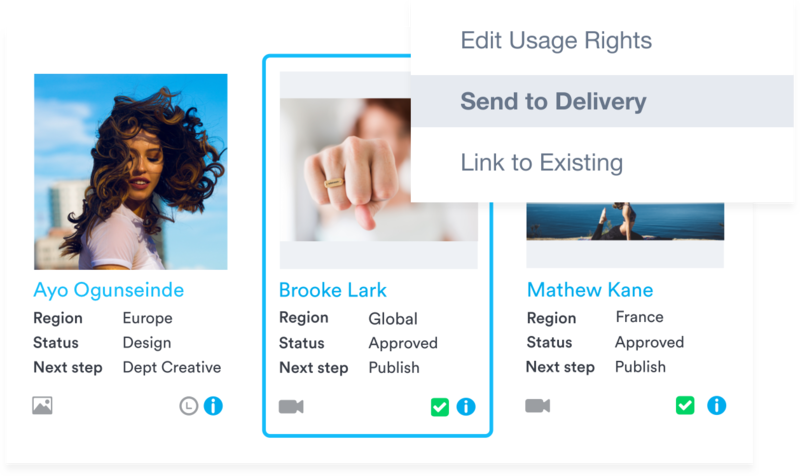 Take control of your campaign and keep your team in-sync with Digital Asset Management's in-depth analytics and powerful communication tools, like comments, annotations and approvals. Don't get stuck waiting for files to upload. Adstream's high-speed file transfer tool enables you to securely upload, download and share massive files faster than ever before. Asset Delivery is everything you need to distribute cross-media content. Save time formatting your content. Simply upload one master file, select your destinations, hit send, and it's automatically adjusted to suit each recipient's unique specifications.